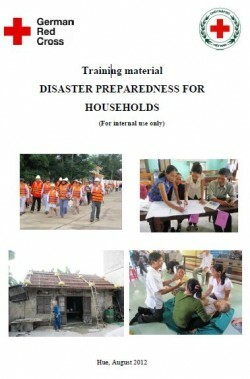 Purpose: The material is developed to to support the training activity on Disaster preparedness for households in the Integrated Disaster Preparedness Project funded by Federal Foreign Office of Germany and German Red Cross through Vietnam Red Cross Society implemented in Thua Thien Hue province. Lesson 1 Hazards and Disasters: definitions, types. Lesson 2 Climate change: definition, expressions and effects, responses. Lesson 5 Evacuation and things should be done during evacuating: definition, kinds, criteria of evacuation place, what should be prepared, templates. Lesson 7 Light first aids and search & rescue in disaster response: definitions, objectives, steps, skills.